Halloween silliness is in the air. Why not channel it into a crafty, productive activity? It started rather spontaneously with none other than the most corny of knock-knock jokes. The kids (6&8) are always trying to make up their own and it sure gets annoying. We had cycled through several pieces of fruit as the repetitive visitor (banana who? banana who?… orange you glad it wasn’t banana again? ), when I felt the need to go over the whole structure of the knock-knock joke to let them try to come up with their own that were actually laughable. I myself am not a jokester. It’s more my husband’s territory. We ran stuff by him to see where it would rate. The kids half-cared what either one of us thought, only that it was funny to them. Calvin, my 6-year-old, wandered off after 15 minutes, but Ava humored me through the joke-creation process. We stretched a bit to come up with ten. Many, we knew, would only be funny to us and mildly funny to others if they knew the back story, which Ava fully intended to share with any audience, curious or not. At some point we started fine-tuning the language and making a list. 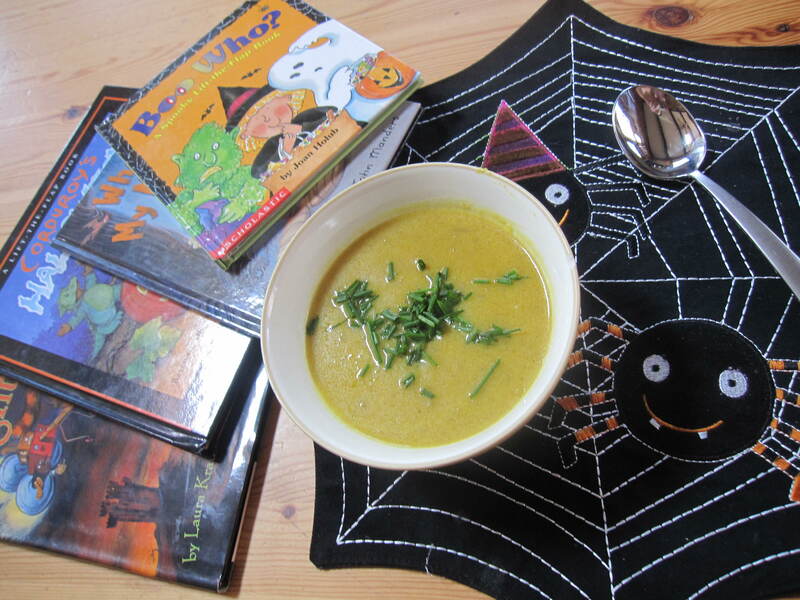 We referenced our Halloween books for inspiration and art. We liked the idea of a lift-the-flap book and the door became the obvious flap to open. We put on our writing, illustrator and publisher hat. We started with a title, cover and table of contents. Title: Who’s at Your Door? 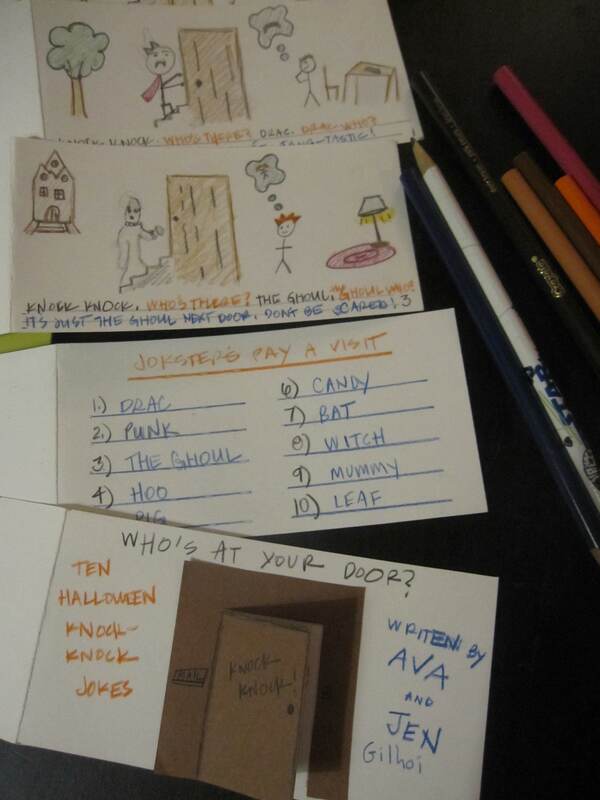 Cover: door with the flap, subtitle of Ten Halloween Knock-Knock Jokes and TOC: Drac, Punk (Pumpkin), The Ghoul, Hoo (Owl), Pig, Candy, Bat, Witch, Mummy and Leaf. I did the writing – alternating colors for responses, Ava did all of the drawing and I colored the pictures. 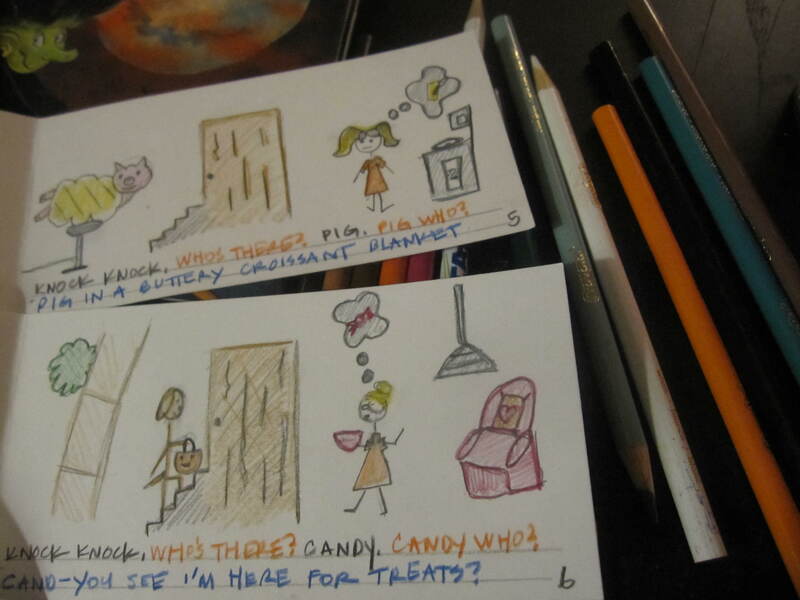 We chose the constant as the door with steps leading up to it (on each of the ten joke pages) and Ava did the bubble-thought drawings to depict what the caller implied they were on the other side of the door. For example,the clueless homeowner pictured a cute blonde girl with pigtails when the caller said they were the ghoul. 2. Punk. Punk who? Punkin pie in your face with Cool-Whip. 9. Mummy. Mummy who? Mummy, you look so frightening in bandages! Three hours later we three-holed punched the pages and thread a ribbon through it. It was a creative, artistic activity and while the jokes were a challenge for them to dream up, Ava really enjoyed figuring out how to best illustrate the dialog through pictures. She’s bringing it to show-and-tell this week. I warned her that others might not get her humor. Such is life. It’s important to know what makes us laugh, I told her, regardless of what others think. Calvin thinks I’m obsessed with the pig in the buttery croissant blanket. I might be, but that’s what makes it darn funny to us. And Ava and I voted. That one is our favorite! 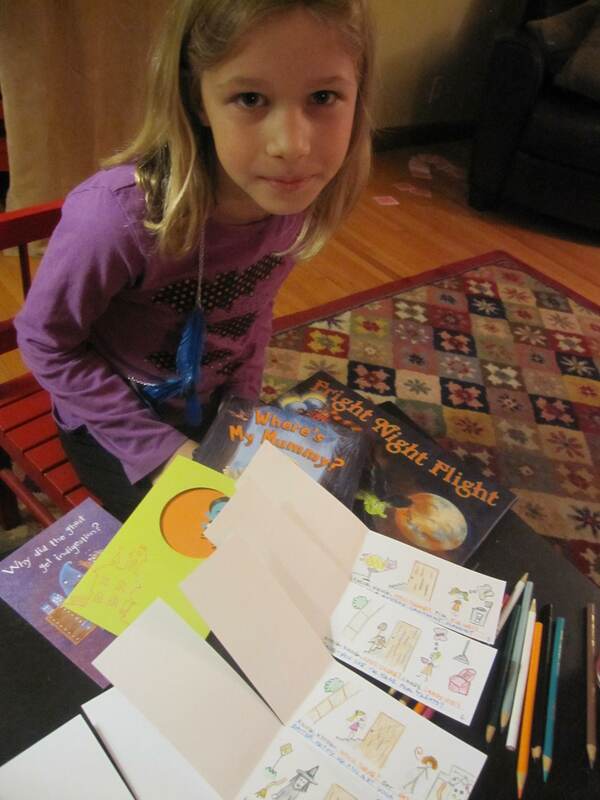 If we do a mini-publishing run on the book, she says she’s open for business and taking orders. Email edamomie@hotmail.com. Books are $4 and part of the proceeds will go to her school’s Media Center. Last Thursday, my last installment of veggies from our CSA (Hay River Farms in WI) arrived, heavier than ever. A dark green pumpkin to which the kids frowned upon and more squash, bringing our total to 14. Last week I took care of the bunches of swiss chard in a time-consuming Martha quiche that no one in the family but me really liked. Next week, we’ll tackle the turnips. Today, I was going with an old recipe standby that Cheryl, a friend of my mother-in-law’s, entered as page number one in my wedding recipe binder: Curried Squash Soup. 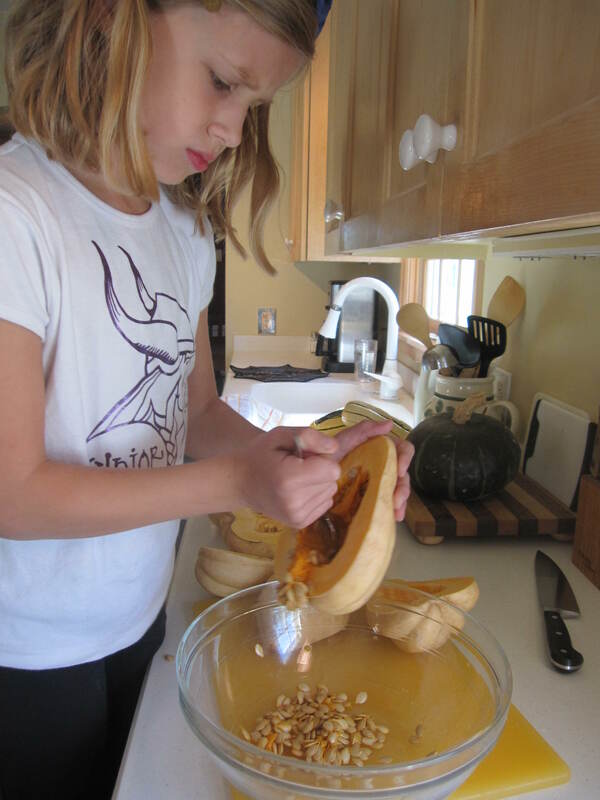 The kids were disinterested in helping beyond the carving out of the squash seeds from the cooked halves. Ava, my 8 year-old, agreed that at least she could contribute some time to the task. Then I was on my own. 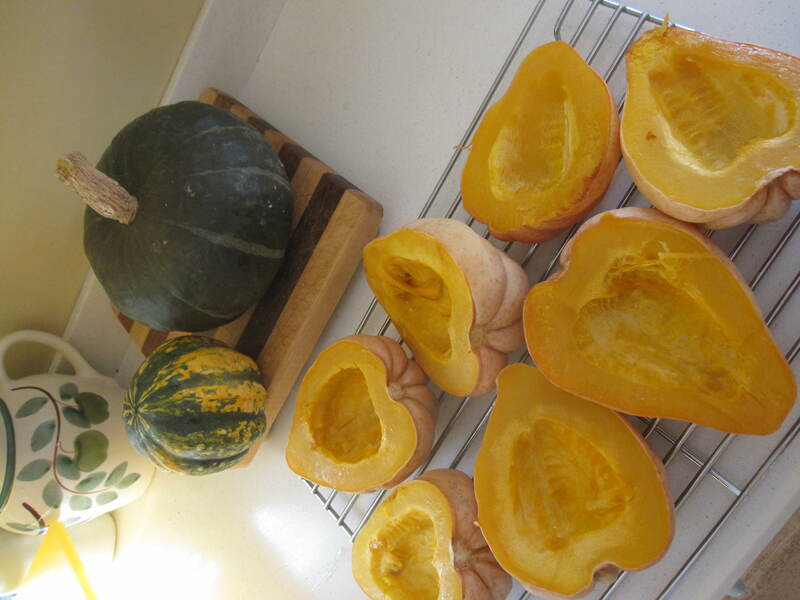 With the oven at 350 the six medium squash, halved, cooked for 50 minutes while I went for a quick fall run. I left the kitchen-vigilant Calvin, my 6 year-old, in charge of overseeing the squash. After I took them out and let them cool, I scraped out the squash from the skin in one very large bowl. From there, I immediately pureed the squash in very small batches in my mini food processor. (Note: Christmas List for this year to include some new appliances!) Several messy minutes later, I had about 12 cups of squash. The recipe called for four pounds of it, which after a Google search I equated to mean 8 cups. Since I had 12, I increased the recipe by half – -always a questionable move. I added too much butter as a result, but passed on some of the cream. Modifications are the mark of a talented chef, right? Despite doing several things not quite right (which is a great reason to make soup – see the movie Ratauoille), the soup tasted pretty darn good. Ava tried some and liked it. Calvin held off, watching me partake in it with his srunched up nose. Yes, there is grass (chives) dashed on the top. I thought that might intrigue him, but no. Plenty of time to warm up to the soup though… seeing as though I now have about 18 cups of it. I’ll freeze it in smaller containers for winter consumption. Thanks to farmer Mike of Hay River Farms for three and a half months of fresh veggies and a lot a new experiments in the kitchen. If anyone knows what to do with turnips, drop me a line. Preheat oven to 350. Place squash cut side down on baking sheet. Bake until soft, about 50 minutes. Scoop out the squash pulp, discard skin. Melt butter in heavy large skillet over medium heat. Add onion, curry and allspice and saute until onion is tender, about 10 minutes. Transfer 1/4 cup of onion mixture, 1/4 of squash and 1 cup of stock to blender. puree. Pour into heavy large saucepan. Puree remaining onion mixture, squash and stock in blender in three more batches. Add to saucepan. Add half & half to saucepan. Bring to boil, stirring occasionally. Reduce heat and simmer 10 minutes. Season to taste with salt and pepper. Can be made one day ahead. Cover and refrigerate. Bring to simmer before serving. Mix chives into soup. Whether you’re walking the half-miler or running the full Twin Cities Medtronic Marathon, this weekends’ weather in the Twin Cities is optimal for a race. I, myself, opted out. Instead, for the past few years I’ve enlisted my 8-year-old, Ava. She ran the half mile last year and the full Diana Pierce Family Mile this year. With very minimal training – a few milers at her school, Hale, and a once-around Nokomis with me – she was set. The race is celebrating its 30th year. It’s well-organized and was much easier this year as we knew the drill from participating last year. Whomever came up with the idea to get the local schools involved was on to something. The kids talk about it at school, parents get involved and the idea of fitness and fun going hand in hand is planted at an early age. My 6-year-old didn’t care to be signed up. That’s fine I told him, he could just cheer on his fellow kindergartners. Next year, you can join in. Parking was free and easy at meters near University and Rice, about a block and a half away from the Capitol grounds. Or you could park for $10 in the lots. Because of the school’s involvement, we picked up her official t-shirt and race number on Friday, saving us a extra trip to St. Paul. Seemingly small detail, but important to busy parents! Stakes with school names near the Capitol helped students and parents gather. We got there in time to join the 9:40a.m. photo of the kids (note for next time, don’t stand in front of H-A-L-E banner). Then, it was time for kids to split up by school and line up by grade. We walked with Ava and the rest of the third-graders to the start point and wished her luck. For the thousands of people there, it was still easy to get around as well as get a good sight line to the starting point. The first group started at 10:00a.m., followed by staggered starts by grade. The miler, as do the half mile, 5 and 10K, starts from the same point. Immediately there’s the hill to the St. Paul Cathedral, then a loop around and back down the hill through the finish line. We timed her separately because the starts are so staggered. We think it was under a 9.30 minute mile. She thought she ran faster than her school timed run of 9.11, but she reminded me there were no hills on that run. The race entry for kids through schools was $10. They got water, bananas, granola bars and chips at the end. We took a few photos, chatted with friends and were back in the car by 10:30. Easy. Then it was breakfast at Mickey’s on West 7th for the racer and us spectators. She thinks next year, she’ll up her game to the 5k (3.3 miles). For this, I might just have to join her. If we can actually run a similar pace together, that will be a milestone I’ve been looking forward to reaching. And, tomorrow, Sunday, October 2, is the big race day if you’re looking for inspiration for your young runners. Get them out on the course to cheer on the grown-up runners!